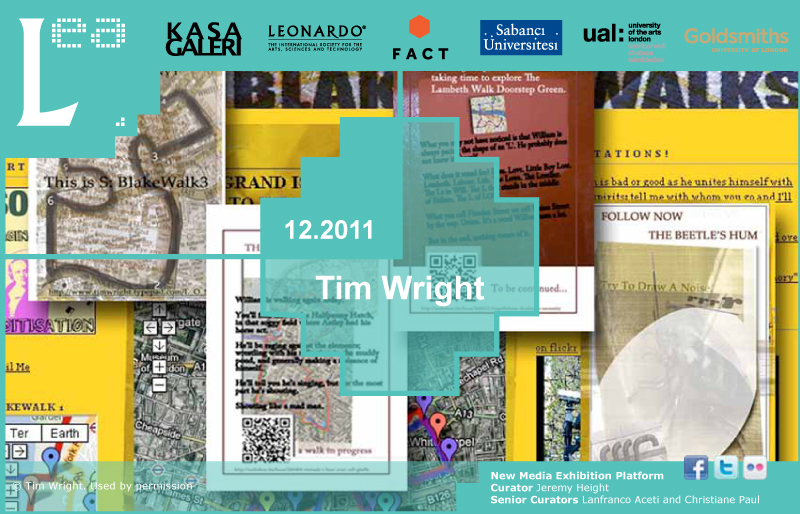 Tim Wright is a writer who uses the potential of new media and internet by real-time and interactive mediums such as ‘bookmapping’ or ‘geo-tagging’. A new dimension of literature is created by blogs, photos, videos, and user generated content within a narrative fiction format. LEA New Media Exhibition invites creative readers and writers to explore new ways of storytelling: By watching, listening, discussing, sharing, remixing, contributing and experiencing. Tim Wright is a digital writer, a cross-platform producer and a director of XPT Ltd. His writing credits include two BAFTA-winning interactive projects: the comedy self help disk ‘Mind Gym’ and web & email drama ‘Online Caroline’. He also co-developed, devised and scripted the BAFTA nominated science-learning Web drama ‘Planet Jemma’ and BAFTA nominated online holiday farce ‘Mount Kristos’. In 2004/5, he created the popular collaborative web fiction and Sony Award-nominated BBC Radio 4 play ‘In Search of Oldton’, pioneering the use of user generated content within a narrative fiction format. He has continued his relationship with Radio 4 contributing to a radical overhaul of Today’s website, whilst writing two further Afternoon Plays that involve online audience participation (‘Say What You Want To Hear’). The web element of the popular public art project ‘The Telectroscope’ was co-developed and written by Tim. He was the lead writer of the RSC’s recent Twitter drama ‘Such Tweet Sorrow’ – and in 2009 he completed ‘Kidmapped!’, an experiment in literary blogumentary, involving a 240-mile walk across Scotland and the use of geolocation and mobile media tools. LEA Interview with Tim Wright by Jeremy Hight.